The "red shirt guy" who carved himself a slice of internet fame at Blizzcon last week has been rewarded with immortality as a character in the upcoming World of Warcraft expansion Cataclysm. A brief recap, in case you missed it: During a Q&A at the Quest and Lore panel at Blizzcon last weekend, a clearly nervous but nonetheless determined young chap stumped Blizzard Vice President of Creative Development Chris Metzen with a question about Falstad Wildhammer and the Council of Three Hammers. He then corrected Metzen's off-the-mark response with authority, leading Metzen to eventually throw Lead World Designer Alex Afrasiabi under the bus for the whole thing. It was a classic awkward-funny moment and now Blizzard is using the Cataclysm expansion to make sure it'll never be forgotten. 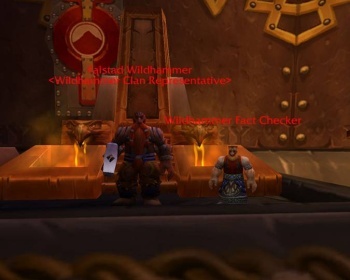 An image posted to the official WoW forums indicates a new addition to the staff of Falstad Wildhammer, the subject of the RSG's question: A diminuitive, red-shirted "Wildhammer Fact Checker." Is it legit? It seems like the sort of thing Blizzard would do but the image was met with considerable doubt until the question was settled by none other than Afrasiabi himself, who silenced the debate with two simple words: "It's real." So congratulations, Red Shirt Guy, wherever you are. You've earned it. World of Warcraft: Cataclysm comes out on December 7.